On this day during your stay in Athens, you can visit the historical museums and monuments in Athens including Acropolis. Overnight Accommodation in Athens. This will be your free day in Athens you can do whatever you want to do and overnight stay in Athens. On this day will get you transferred from a hotel in Athens to Santorini by a Ferry Service. On reaching the Santorini port you will be transferred to the hotel in Santorini and you can spend the rest of the day in the way you like and overnight Accommodation in Santorini. You will have time to enjoy the beautiful beaches in Santorini, you can also opt for optional excursions to visit the volcanoes in Santorini. You will arrive in Fira around 16:00 with the rest of the day all yours. Overnight stay in Santorini. After your breakfast in the hotel, you will be transferred to the port for Athens. On arrival at Athens port, you will be transferred to Athens airport will complete your trip with us. Planning a trip for these holidays? If you are yet confused about where to go these vacations then you should definitely look towards Athens and Santorini as a mesmerizing place to travel located in Greece. 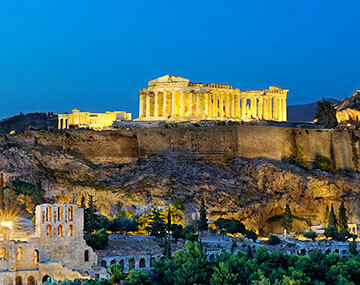 Athens is one of the oldest cities in Greece and is the perfect blend of city’s culture and social life. There are a large number of iconic monuments, historical museums and much more. Athens has been rated as the third best city in Europe by European Best Destinations. Santorini is a group of islands such as Palea, Thira, Thirassia, Aspronissi and NeaKameni. The group of islands of Santorini has the only volcano with a crate in the sea. So, a holiday in Athens and Santorini with beautiful islands, numerous beaches, and rich cultural heritage. Now if you had decided to get yourself enjoyed in Athens and Santorini in the lap of nature so that you can again fill yourself with a new energy then you should definitely go for a good holiday package to Santorini and Athens. We have designed a special package for you which will cover all the places to visit in Athens and Santorini and will do all the reservations without you need to worry about your holiday. You can find many cheap holiday deals to Santorini and Athens. I love to see the beautiful historical monuments and this is one its kind of place. VAOWww the statues was made so gracefully.